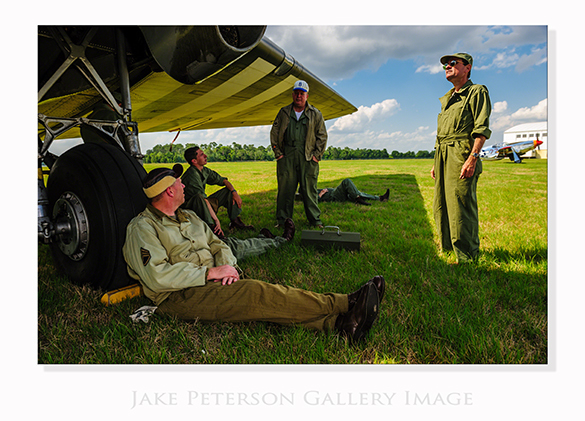 One of the really cool aspects of the Precon this past Tuesday was the re-in-actors that came in and posed for in front of the planes. These guys actually do this as a hobby between there regular jobs. They go around to different events and try and bring back the look and feel of the era. They really are good WWII reinactors. At one point they were laying underneath the wing of the C-47 which was a common thing to do at air force bases. Ground crews would use the shade produced by the planes wing to cool off. As you can see, in the hot Florida sun, these guys had the same idea.